Kaj ogroža delfine v SV Jadranskem morju? Common Bottlenose Dolphins (Tursiops truncatus) are mostly at risk due to rising anthropogenic activities. Contrary to several literary sources claiming that there is only one Mediterranean subpopulation, there are actually several subpopulations in this marine basin. The Mediterranean subpopulation is vulnerable and decreasing by the IUCN red list of threatened species. It is further suspected to decline. In the subpopulation in the Adriatic sea alone, the number of dolphins has already declined by more than fifty percent in the last five decades, meaning that we need to be cautious in stating its realistic status (for more information, see: FEB 2014 Guidelines for Using the IUCN Red List Categories and Criteria). The high reduction of the dolphin number was primarily the result of planned killings which went on from the second half of the nineteenth century until the 1960’s, when dolphins were perceived as pests. In addition to the killings that still occur within the global population, further decline of bottlenose dolphins is now substituted with other growing anthropogenic pressures, some of which we observe directly while collecting data from our research area. Loss of habitat quality, its degradation and environmental contamination. The dumping of waste, including industrial, sewage, and nuclear, was legal until the 1970’s. More regulations are in place, but illegal dumping still occurs. In addition, run-off that soaks up toxins from fertilizers and pesticides gets washed into rivers that eventually lead to the ocean. All of this is also exacerbated by maritime transportation and atmospheric pollution. Not only does chemical input affect marine animals and human health, it also causes bacteria and plants to deplete oxygen and create an environment that kills healthy marine life and destroys ecosystems, a process called eutrophication. This process has affected the northern Adriatic more so than anywhere else in the Mediterranean since the 1970’s. The effects of it are serious– the Adriatic has seen rises in the level of surface temperature and salinity, and decreases in water transparency and oxygen levels (Bearzi et al. 2004). All of these chemicals, toxins, and imbalances have serious side effects on the health and reproduction of bottlenose dolphins. The toxins are absorbed or eaten by organisms and gradually make their way up the food chain, even affecting humans. High levels of DDT, PCP’s and heavy metals have been found in dolphins from the Mediterranean (Shoham-Frider et al. 2009). In the Croatian waters of the Adriatic, dolphins were found to have higher concentrations of cadmium, arsenic, lead, and mercury in their livers, kidneys, and muscles (Bilandžić et al. 2012) The accumulation of these contaminants has serious effects on testosterone and the reproductive ability of males (Wells and Scott, 1999), and Cockcroft et al. (1989) determined that sadly, first-born calves received 80% of their mother’s body burden of contaminant residues, perhaps leading to increased neonatal mortality. The US Navy marine mammal program maintains dolphins in open netted enclosures in the San Diego Bay and conducts tissue analysis on mothers and newborn calves from their breeding program. They found that the DDT levels in calves that died within six months was three times higher than in calves that survived. PCB levels were two and a half times higher in the mothers of calves that didn’t survive versus mothers of calves who did (Reddy et al. 2001). Tributyltin is a toxic compound that was used for many decades in paint on the bottom of marine vessels to prevent biofouling (the build up of algae, microorganisms, or animals such as barnacles). It leaches into marine environments and once in the tissues of animals can cause immunosuppression and in some instances, hearing loss for marine mammals. Focardi et al. (2000) determined concentrations of tributyltin (TBT), plus its degradation products monobutyltin (MBT) and dibutyltin (DBT), in livers and kidneys of dolphins stranded along the western Italian and Greek coasts. As with DDT, BTs were found to be transferred from mother to fetus. Although our sources list contaminants in the tissues of only a handful of populations, this environmental contamination issue is one that affects all populations, worldwide. Overfishing and less available prey. The fat layer in dolphins has the primary function of thermoregulation. In many instances, we see that dolphins are underweight, indicating that that animals are expending more energy to find sufficient food because of the depletion of fish stock. This would consequently lead to an increase in opportunistic behaviors such as foraging around nets, thereby putting the dolphins at risk of getting tangled and drowning while also adding to the animosity between dolphins and fishermen. This animosity leads to a higher rate of negative interactions. 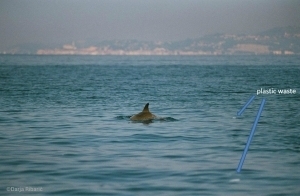 In many cases, fishermen don’t respect the approaching recommendation for their boats and will chase away the dolphins’ families and/or groups, and even, on occasion, illegally use dynamite (witness statement for the area off Istria, Croatia). An example from the middle Adriatic, near the island Pašman, here. 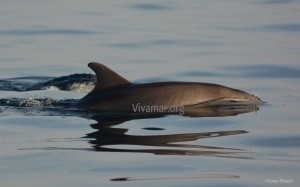 Continuous close observation and thorough reports are needed as well as suggestions to ensure correct measurement steps for the conservation of bottlenose dolphins, long-term sustainability of their (and our) feeding environment, and to reduce harmful dolphin-fisherman interactions in this marine area. Nets: Incidental by-catch and entanglements. Interactions between dolphins and fisheries are frequent in our research area, as well as around the world. Fishermen cast large nets to catch fish for human consumption. Oftentimes, the fish they are catching for humans are also the main course for a dolphin’s meal. This leads to opportunistic feeding behavior by the dolphins since their fish supply is dwindling and these trawls hold higher concentration of their prey. Dolphins get caught in the nets and drown. In 10% of dolphins stranded in our area along the Croatian coast, mortality occurred from the ingestion of gill-net parts that result in larynx strangulation (Gomeric et al. 2009). Fisheries around the world account for incidental takes of bottlenose dolphins, including Peruvian, Japanese, UK and US waters, the Adriatic and Mediterranean, China, Australia; the list grows with the amount of nets put into the water. These nets account for thousands of dolphin deaths every year. Fishing nets aren’t the only nets that are cause for concern. Deaths also occur (not only dolphins- sea turtles and sea lions as well!) from shark nets used to keep sharks away from swimmers in places like Australia and South Africa (Atkins et al. 2013, Hamer et al. 2013, Krogh and Reid 1996). “Dolphins were found with full stomachs, indicating recent feeding in the vicinity of the nets and there was a correlation of mortality rates with the direction of the prevailing current.” (Wells and Scott, 1999). Interactions between fishermen and dolphins are frequent in this area. Any mechanized maritime traffic, including fishing, cargo, personal and touristic boats and yachts, create pollution and disturbances through underwater sound. Not only do boats create a lot of loud underwater noises (sound travels faster and hundreds of times farther without any loss of signal compared to land! ), they also cause stress for the dolphins and in many cases physical injury. In a study researching dolphin behavior when boats are nearby or approaching, dolphins had longer interbreath intervals when boats approached compared to control periods (no boats within 100 m). 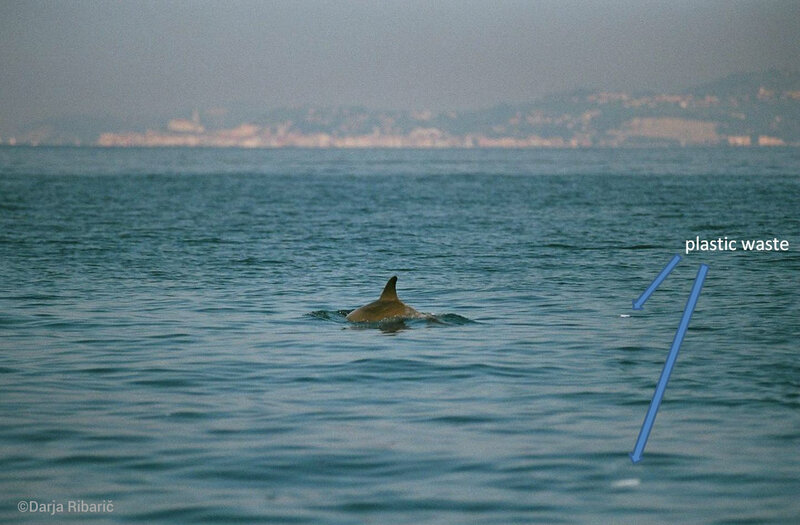 Dolphins decreased interanimal distance, changed heading, and increased swimming speed significantly more often in response to approaching vehicles (Nowacek et al. 2001). Dolphin-tourism is currently gaining popularity as an economic activity. An ideal touristic operation would use dolphin sightings and tours as a means to educate the public on how important protecting the animals and their environment is. But because the nature of a dolphin “sighting” tour revolves around viewing dolphins, there is more likelihood that these mechanized boats (unless managed responsibly) will approach and follow dolphins in a way that could create more stress for dolphins. Given that dolphins are already subject to interference from fishing and cargo boats, underwater construction and research activities, it is incredibly important to plan and maintain effective touristic-management plans that limit harassment and stress to dolphins and all other marine life. Atkins, S., Cliff, G., Pillay, N. (2013.) Humpback dolphin bycatch in the shark nets in KwaZulu-Natal, South Africa. Biological Conservation, Vol. 159, pp. 442-449. Bearzi, G., Holcer, D., Notarbartolo Di Sciara, G. (2004). The role of historical dolphin takes and habitat degradation in shaping the present status of northern Adriatic cetaceans. Aquatic Conservation: Marine and Freshwater Ecosystems, Vol. 14(4), pp.363-379. Bilandžić, N., Sedak, M., Đokić, M., Đuras Gomerčić, M., Gomerčić, T., Zadravec, M., Benić, M., Prevendar Crnić, A. (2012). Toxic element concentrations in the bottlenose (Tursiops truncatus), striped (Stenella coeruleoalba) and Risso’s (Grampus griseus) dolphins stranded in Eastern Adriatic Sea. Bulletin of Environmental Contamination and Toxicology, Vol. 89(3), pp.467-473. Cockcroft, V.G., DeKock, A.C., Lord, D.A., Ross, G.J.B. (1989). Organochlorides in bottlenose dolphins Tursiops Truncatus from the east coast of South Africa. South African Journal of Marine Science, Vol. 8, pp. 207-217. Culik, B. (2010) Tursiops truncatus. Convention on the Conservation of Migratory Species of Wild Animals. Web.15 Jan. 2016. <http://www.cms.int/reports/small_cetaceans/data/t_truncatus/t_truncatus.htm>. Gomercic, M.D., Galov, A., Gomercic, T., Skrtic, D., Curkovic, S., Lucic, H., Vukovic, S., Arbanasic, H., Gomercic, H. (2009). Bottlenose dolphin (Tursiops truncatus) depredation resulting in larynx strangulation with gill-net parts. Marine Mammal Science, Vol. 25, pp. 392-401. Hamer, D.J., Goldsworthy, S.D., Costa, D.P., Fowler, S.L., Page, B., Sumner, M.D. (2013). The endangered Australian sea lion extensively overlaps with and regularly becomes by-catch in demersal shark gill-nets in South Australian shelf waters. Biological Conservation, Vol.157, pp.386-400. Krogh, M., Reid, D. (1996). Bycatch in the protective shark meshing programme off south-eastern New South Wales, Australia. Biological Conservation, Vol. 77(2), pp. 219-226. Nowacek, S.M., Wells, R.S., Solow, A.R. (2001). Short-term effects of boat traffic on bottlenose dolphins, Tursiops truncatus, in Sarasota Bay, Florida. Marine Mammal Science, Vol. 17, 673-688. Ocean Pollution – MarineBio.org. MarineBio Conservation Society. Web. 15 Jan. 2016. <http://marinebio.org/oceans/ocean-dumping/>. Reddy, M.L., Reif, J.S., Bachand, A., Ridgway, S.H. (2001). Opportunities for using Navy marine mammals to explore associations between organochlorine contaminants and unfavorable effects on reproduction. Science of the Total Environment, Vol. 274(1), pp.171-182. Shoham-Frider, E., Kress, N., Wynne, D., Scheinin, A., Roditi-Elsar, M., Kerem, D. (2009). Persistent organochlorine pollutants and heavy metals in tissues of common bottlenose dolphin (Tursiops truncatus) from the Levantine Basin of the Eastern Mediterranean. Chemosphere, Vol. 77, pp. 621–627. Wells, R.S., Scott, M.D. (1999). Bottlenose dolphin – Tursiops truncatus (Montagu, 1821) In Handbook of marine mammals. Ridgway, S.H., Harrison, S.R. (eds.) Vol. 6: The second book of dolphins and porpoises. pp. 137-182.